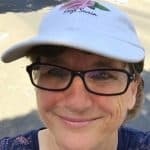 If you have a new grandchild, I’m here to tell you that there are some great resources for grandparents here in Roseville CA. Two of my favorites over the last few months are NextDoor.com and neighborhood yard sales. With a brand-new grandbaby and no current supplies on hand I am really appreciative of the various neighbors I enjoyed meeting through both NextDoor and yard sales the last couple of months. 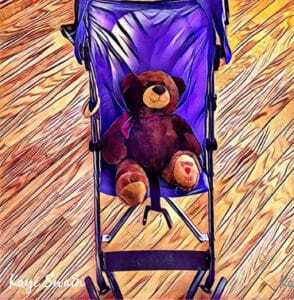 When it was time for grandbaby to start playing on the floor I wanted to give him some fun stuff that he could actually touch even though he couldn’t yet crawl, grab, etc. I spotted one of those activity gym play mats that are so popular nowadays. I checked Walmart and Amazon and discovered they run about $30-$80 brand new. 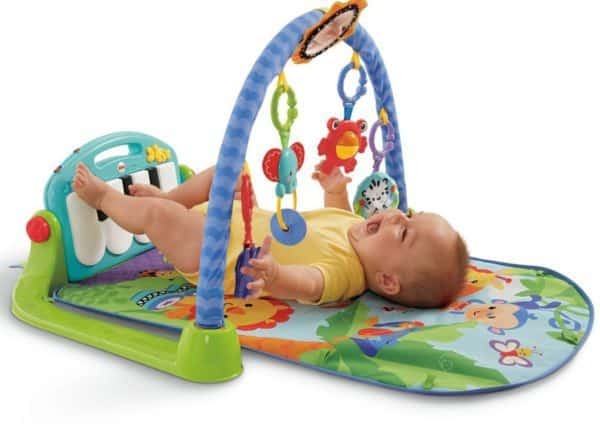 A couple of days later, I noticed an activity gym play mat for sale by a neighbor on NextDoor.com for only about $7. After checking that it was washable, I picked it up later that day. The next time my sweet grandchild came to visit, what fun we had. He, his sweet great-grandma and I all enjoyed extra smiles. He had so much fun bonking the different items with his cute little waving hands. I thoroughly enjoyed taking tons of photos. And great-grandmama loved watching it all! A couple of weeks later, before I had any need of it, I spotted a lovely high chair. It came complete with a reclining back so you can use it a little earlier than the norm. It was priced well under the original $125 price tag on Amazon. Naturally, it needed some cleaning – many used items will – though others are totally immaculate. Either way, that’s fine by me. I took it home and wiped it down. BUT I did make one mistake. Rather than work on the belt, I checked the Fisher-Price website and saw they offer replacement parts. Since I was in the midst of it all, I just cut off the belt, finished wiping it down, and went to order a new belt. OUCH! When you CLICK on replacement parts, it goes to a screen that says, NO REPLACEMENT PARTS AVAILABLE! I tried a generic all-high-chair belt but it was too wide. Fortunately, the chair has a bumper that goes between the legs. I added a thin kids belt and just use those two and it works well. Particularly since I sit right with him. 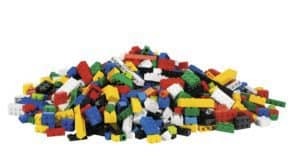 My older grandkids are going to LOVE my latest purchase – awesome LEGOs that I bought for $7.50 per pound. I got a huge gallon size baggy full ++ AND some cute LEGO people for $1 each. Another great resource for parents and grandparents is the Just Between Friends (JBF) Roseville sale events. And not JUST Roseville as you can see below. They offer gently used items at great prices and are a terrific resource for both the buyers and the sellers. Here’s the 2017 schedule for our greater Sacramento Valley area to give you an idea of dates and addresses BUT be sure to click here for the latest dates and addresses as they do change periodically! Just click here now for the JBF Roseville sale info and click here for all the JBF sale locations. Now that the weather is getting more and more glorious, I’m looking forward to yard sales! I did find one via NextDoor a few weeks ago and got some fun books I’m looking forward to reading to my grandkids. I can’t wait to visit more. My personal fave is to find great yard sales while I’m out telling neighbors about an upcoming open house or delivering neighborhood updates! Combining two fun events in one is a definite win-win, don’t you think? CraigsList and NextDoor are both good resources for finding yard sales along with the classified section in the Sacramento Bee. Also, don’t forget to check out Once Upon A Child. That store has been a family favorite of ours for years. Our Roseville Once Upon A Child is open seven days a week. You can find it at 384 Roseville Square, Roseville 95678 916-774-0852. We’ve often found great gems at delightful prices there! AND be sure to sign up for the their text option – they send out some awesome coupons and special offers periodically! These are all great resources for parents and grandparents in the Roseville Sacramento area and beyond. (For that matter, NextDoor & yard sales are great resources for a whole ton of goodies, aren’t they! 🙂 ). Do you have other go-to resources? We’d love to hear. 5 Your Go-To Grandparent Resources? Are You Ready to Spring Forward Wisely in Roseville?